Previously teased at SXSW, Borderlands 2's sixth playable character has finally been revealed at PAX East this week. The newcomer is a "Vault Hunter" named "Krieg the Psycho" who adds a psycho bandit-type class to the mix. 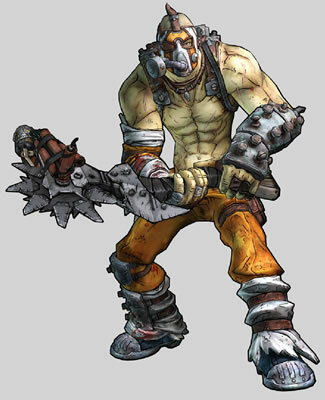 As you might expect, Krieg likes to be up close and personal focusing on melee-oriented attacks, including one named "Buzz Axe Rampage," though he reportedly has a few ranged abilities throughout his three skill paths. The Bloodlust tree is said to be focused on building combat bonuses, Mania encourages you to "go insane" in high risk, high reward attacks, while Hellborn leans toward elemental-related abilities -- particularly fire. Krieg isn't listed on Borderlands 2's official character page yet, but we imagine he'll appear soon as the Psycho Pack (which includes the new playable character) is expected to launch in May for $9.99 or 800 Microsoft points. Ahead of that DLC, Gearbox plans to release an Ultimate Vault Hunter Upgrade Pack that raises the level cap from 50 to 61, adds "Pearlescent" equipment and enables a third playthrough via the Ultimate Vault Hunter mode. It's worth noting that unlike the Psycho Pack, this offering will be included in the game's Season Pass if you've already ponied up for that. If not, the new level cap and game mode will set you back $5 or 400 Microsoft Points. It has also been revealed that the final piece of Borderlands 2's story DLC will arrive two months after the Psycho Pack in June. Few details are available, but it's said to be included in the Season Pass or cost $9.99 alone.